The Casey's General Store 150 presented by Vatterott College will air on NBCSN on Thursday, Aug. 3 at 7 p.m. ET. 1. (2) Todd Gilliland, Sherrills Ford, N.C., Toyota, 150 laps, 89.829 mph. 2. (9) Chase Purdy, Meridian, Miss., Toyota, 150. 3. (7) Harrison Burton, Huntersville, N.C., Toyota, 150. 4. (6) Chase Cabre, Tampa, Fla., Toyota, 150. 5. (3) Ben Kennedy, Daytona Beach, FLA, Toyota, 150. 6. (10) Ronnie Bassett, Jr., Winston-Salem, NC, Chevrolet, 150. 7. (8) Jesse Little, Sherrills Ford, N.C., Toyota, 150. 8. (1) Ruben Garcia Jr., Mexico City, Mexico, Toyota, 150. 9. (5) Tyler Dippel, Wallkill, N.Y., Ford, 150. 10. (4) Collin Cabre, Tampa, FL, Toyota, 150. 11. (15) Reid Wilson, Huntersville, N.C., Chevrolet, 150. 12. (16) Jay Beasley, Las Vegas, Nev., Toyota, 150. 13. (11) Dillon Bassett, Winston-Salem, N.C., Ford, 149. 14. (13) Jeff Green, Owensboro, KY, Toyota, 149. 15. (17) Brandon Oakley, Beavercreek, Ohio, Chevrolet, 148. 16. (14) Vinnie Miller, Metamora, Mich., Toyota, 148. 17. (12) Trey Hutchens, Lexington, NC, Chevrolet, 140, mechanical. 18. (18) Jesse Iwuji, Carrollton, TX, Chevrolet, 133. 19. (19) John Wood, Eagle, ID, Chevrolet, 131. Caution Flags: 0 for 0 laps. Lead Changes: 0 among 0 drivers. Standings: 1. H. Burton, 427; 2. T. Gilliland, 421; 3. C. Purdy, 377; 4. R. Bassett, Jr., 366; 5. R. Garcia Jr., 353; 6. C. Cabre, 351; 7. J. Beasley, 328; 8. D. Bassett, 315; 9. T. Dippel, 314; 10. C. Cabre, 310. 1. (3) Todd Gilliland, Sherrills Ford, N.C., Toyota, 150 laps, 89.829 mph. 2. (2) Chris Eggleston, Erie, Colo., Toyota, 150. 3. (4) Michael Self, Park City, UT, Ford, 150. 4. (6) Will Rodgers, Solvang, Calif., Ford, 150. 5. (1) Derek Kraus, Stratford, Wis., Toyota, 150. 6. (13) Julia Landauer, New York, N.Y., Ford, 149. 7. (7) Todd Souza, Aromas, Calif., Toyota, 149. 8. (9) Matt Levin, Tucson, Ariz., Chevrolet, 149. 9. (8) Blaine Perkins, Bakersfield, Calif., Chevrolet, 149. 10. (11) Ron Norman, Tucson, Ariz., Chevrolet, 148. 11. (15) Stafford Smith, Eagle, Idaho., Ford, 148. 12. (5) Nicole Behar, Spokane, WA, Toyota, 147. 13. (18) Bill Kann, Scottsdale, Ariz., Chevrolet, 146. 14. (14) Takuma Koga, Nagoya, Japan, Chevrolet, 144. 15. (16) Jesse Iwuji, Carrolton, Texas, Chevrolet, 133. 16. (17) John Wood, Eagle, ID, Chevrolet, 131. 17. (12) Bryant Barnhill, Myrtle Beach, SC, Ford, 107, fuel pump. 18. (10) Kody Vanderwal, LaSalle, Colo, Ford, 69, overheating. Standings: 1. T. Gilliland, 402; 2. C. Eggleston, 384; 3. D. Kraus, 332; 4. W. Rodgers, 322; 5. M. Self, 310; 6. T. Souza, 292; 7. J. Landauer, 284; 8. B. Perkins, 284; 9. M. Levin, 283; 10. K. Vanderwal, 282. Eureka, CA (July 23, 2017) – After a long three-week break, racing returned to Redwood Acres Raceway this past Saturday for Nor-Cal Automotive Night at the Races. It was a picture perfect day at the 3/8-mile paved oval as the North State Modified Series made their second of three visits to the Acres this season. Nick Ford set fast time for the California State And Federal Employee’s Credit Union roadrunner division with a 20.461. Andy Savage led the opening lap of the first 20-lap main event which was run in normal fashion. On lap two, Ford moved to the lead, a position he would never relinquish. Jake Keeling and Tim Ratzlaff traded the second position until Daniel Buell took over the position. At the finish it was Ford taking the win over Buell, Keeling, Ratzlaff and Zito. The second feature was run backward. Bob Ratzlaff led lap one but Tim Ratzlaff took over on lap two. The race was highlighted by a thrilling duel for the lead and the race win between Tim Ratzlaff and Buell. On the last lap, Buell made a charge for the lead going down the back stretch. In the final turn, Ratzlaff suffered tire issues and hit the wall. Buell was able to move past to take the lead and the win. Tim Ratzlaff held on for second followed by Ford, Ratzlaff and Keeling. Fast time for the Nor-Cal Automotive Legends division was paced by Brad Curtice with a 18.121. Curtice took the trophy dash. He followed that up with a win in the heat which saw an unfortunate incident in turn four when Anissa Curtice hit the wall. Fortunately she was okay but done for the night. The opening five laps of the 25-lap main were led by Daniel Whitley. On lap six, Curtice took over and never looked back. Whitley did all he could to pressure Curtice but never could force a mistake. Curtice took the win followed by Whitley, Brent Mack, Tyler Peach and Mkinzy Uselton. In the Fortuna Wheel & Brake bomber division, visiting driver, Ron Duke, Jr. set fast time with a 18.651. John Lally won the trophy dash while the heat race was taken by Kolby Jackson. The 25-lap main featured several spectacular incidents. The first occurred in turn three on lap 14, Jim Redd got together with Duke in turn three bringing out the yellow flag. On the restart, Bethany Rapp got into Jackson sending Rapp’s car over the hood of Jackson. Up front, Lally was dominant leading the final 21 laps. At the finish it was Lally winning over Jackson who made a thrilling run through the field in the final handful of laps. Jimmy Sorrels was third followed by Chris Naughton and Kimberly Sorrels. Brett Murrell was quickest in the Humboldt Hydroponics mini stock division with a time of 18.848. Brian Murrell, Sr. won the dash while Brett Murrell claimed the heat race. The first three laps of the 25-lap feature were led by Scott Taylor. On lap four, Brett Murrell moved to the lead. A restart on lap eight allowed Murrell, Sr. to move to the lead. The father/son duo had a great duel for the win with Murrell, Sr. coming out on top. Brett Murrell took second while Eugene Palmer, Troy Lee and Taylor rounded out the top five finishers. Qualifying for the Lone Star Junction Thunder Roadsters was led by Paul Peeples, Jr. with a 17.399. Peeples went on to win the trophy dash while Tommy Payne was the heat race winner. Ronnie O’Neil held the lead for the first three laps but the 30-lap feature was dominated by Peeples. He took the lead from O’Neil on lap four and was able to drive away from the field. At the checkered flag it was Peeples winning followed by Payne, O’Neil, Chris Lawrence and Mac Collado. Charlie Collins was the fastest of the 19 North State Modified Series drivers with a time of 16.267. The winner of the Lucas Oil Dash for Cash was modified veteran, Richie Potts. The invert for the 60-lap feature was four which gave Randy Houston pole position. Darrin Knight briefly moved to the lead at the start from his outside front row position but Houston’s inside line prevailed. A cat-and-mouse game for the lead ensued between Houston and Knight. As the two moved through slower traffic, Houston was able to gain an advantage. The lone caution flag flew on lap 48 when Orion Mosher spun off turn four. The restart gave Knight and the rest of the field another chance to challenge Houston. Nobody had anything for Houston on the night as he led wire-to-wire to score the victory. Knight held on for second over Collins, Kris Price and Darrin Sullivan. Eureka, CA (July 26, 2017) – A late addition to Redwood Acres Raceway’s 2017 schedule is set for the next race scheduled for Saturday August 5th. The 3/8-mile paved oval in Northern California will host a Bomber Bash presented by Four Star Realty, Lally Motorsports and Renner Petroleum. As happened during the 2016 Fall Spectacular, there will be two 50-lap features, each paying $1,000 for first place. The payout for both events for second on back are $500 for second, $300 for third, $200 for fourth and $150 for fifth. Drivers who finish in positions sixth on back will get $100. There is no entry fee on the night for the bombers, only pit passes have to be purchased. The two-race event could shake up the point standings in the local bomber division presented by Fortuna Wheel & Brake. Currently John Lally leads Jim Redd by 37 points followed by Bethany Rapp who is 38 points behind. Kolby Jackson holds down fourth, 49 points behind Lally while Kim Sorrels is 75 points in arrears to the leader. Should Lally face troubles, all four competitors could close the gap. Likewise, it could be an opportunity for Lally to extend his championship lead. Last year’s Bomber Bash during the Fall Spectacular had a great turnout with 20 cars and drivers. Roseville racer, Erick Ray was the winner of the first feature while Lake County racer, Terry Pittman won the second main. Ryan Walters was the overall two-race champion. Other top stars in the division include R.J. Randall of Ukiah and Kelseyville’s Mike Sullivan. Both drivers have found their way to victory lane at the Acres in 2017. Another competitor who has won this year is Jeff French of Laytonville. French won the feature on July 1st. More of the top competition in Northern California is expected to enter the event as it nears. DAYTONA BEACH, Fla. (Aug. 26, 2017) — The NASCAR K&N Pro Series East and West head to Iowa Speedway in Newton, Iowa, for the annual Casey’s General Store 150 presented by Vatterott College on Friday, July 28 — an annual combination race between the two divisions. Below is a look at the race itself and some of the selected participants. • Todd Gilliland is both the NASCAR K&N Pro Series West point leader and the most recent winner in the NASCAR K&N Pro Series East, having won last time out at New Hampshire Motor Speedway for his fifth win of the season overall. • Harrison Burton has four wins this season to lead the East standings by 14 points over Gilliland. • Gilliland has four West wins and leads that series by 11 points over teammate Chris Eggleston. • Designed by NASCAR Hall of Famer Rusty Wallace, the .875-mile asphalt tri-oval was patterned after Richmond (Va.) International Raceway. The first race at the track was held in September 2006. • The first NASCAR-sanctioned race at Iowa was in May 2007, as a NASCAR K&N Pro Series East-West combination event was won by a 17-year-old Joey Logano, the 2015 Daytona 500 champion. • The 14 East-West combination events at Iowa have produced 13 different overall race winners and 12 different overall pole winners. Brandon McReynolds, who swept the two K&N Pro Series races at the track last season, is the only repeat overall winner at Iowa. • Iowa held one East-West combination race each season from 2007-2011 and had two each year from 2012-2015. • The K&N Pro Series West had a standalone event at the track in September 2009 won by David Mayhew. • Kyle Busch, Cole Custer and Brandon McReynolds are the only three drivers to win the East-West combination race at Iowa from the pole. Current Monster Energy NASCAR Cup Series driver Chase Elliot started the furthest back and won, coming from 15th on the grid in May 2012. • Chevrolet has gone to Victory Lane in seven East-West events at Iowa, while Toyota has six wins and Ford has one. • Sits fourth in the East standings with one win, six top fives and six top 10s through nine races. • Won the season opener at Florida's New Smyrna Speedway for his first career win. • Heads into the weekend on the strength of four straight top fives, including back-to-back podium finishes, after three straight finishes of 14th or worse dropped him out of the series point lead. • Has two top 10s, including a best finish of third overall, in four career starts at Iowa. • Holds the K&N Pro Series East points lead with four wins, eight top fives and nine top 10s in nine races this season. • Leads the series with eight top-five finishes this season and is one of only two drivers to finish in the top 10 in every start. Has not finished worse than sixth this year. • Finished 26th overall last season in his only career start at Iowa. • Has eight career K&N West wins with 26 top fives and 30 top 10s in 39 career starts. • Was the 2015 series champion as a rookie for Bill McAnally Racing. • Sits second in the overall West standings, just 11 points behind leader Todd Gilliland, with three wins, seven top fives and eight top 10s in eight races. • Has three top fives in West competition in four starts at Iowa. • Finished a career-best second at Bristol and has three straight top-10 finishes entering Iowa. • Sits fifth in the East standings with two top fives and seven top 10s in nine races this season overall, having already set new career highs for top fives and top 10s. • Was the 2015 NASCAR Peak Mexico Series champion with four wins, 15 top fives and 41 top 10s in 61 career starts in that series. • Engine trouble ended his night at Iowa last season after only 40 laps in his track debut. • Won four of the first five K&N Pro Series West races this season, including a sweep of Twin 100s at Irwindale on March 25, and owns 14 career K&N Pro Series wins. • One of only two drivers to finish in the top 10 in all nine East races this season, he sits second in the current K&N East standings with two wins, six top fives and nine top 10s through nine races. • In West competition, won the first five pole awards of the season and four straight races — California's Kern County Raceway Park, California's Irwindale Event Center (twice) and Spokane (Wash.) County Raceway. • Has four wins, six top fives and eight top 10s in eight West races this season to lead the series standings by 11 points over Chris Eggleston. • Won at Iowa last season after qualifying on the outside of the front row in his only career start at the track. • Making his first K&N Pro Series start since 2015, when he competed in a West race at Arizona's Phoenix International Raceway. • Has two career K&N Pro Series wins, at Florida's Five Flags Speedway and North Carolina's Bowman Gray Stadium, both in 2013, his last full season in the East. • Has one top 10 in five career K&N Pro Series East starts at Iowa. • Finished 20th at Iowa last month in the NASCAR XFINITY Series, and has two top 10s in four career Camping World Truck Series starts at the track. • Made his K&N Pro Series debut with the East at New Smyrna and finished third. • Sits third in the current West standings with five top fives and six top 10s through eight races. • Finished a career-best second at Kern County in March. • Making his second K&N Pro Series start of the season after finishing 23rd at Bristol (Tenn.) Motor Speedway in April. • Won one of his two career East races at Iowa, when he finished second overall to Brandon McReynolds in 2015. • In eight career starts at Iowa, has three top fives and five top 10s. • Finished ninth at Iowa in last month’s NASCAR Camping World Truck Series event. • Is third in the current East standings with three top fives and five top 10s through nine races. • Finished a career-high second in the first of two 100-lap events at Virginia's South Boston Speedway and matched that effort two weeks ago at Michigan's Berlin Raceway. • Won his fourth consecutive pole in the most recent event at New Hampshire, giving him six straight starts on the front row entering the race at Iowa. • Is the highest-ranking rookie in the K&N Pro Series East after nine races. • Has six career K&N West wins, including two at both Minnesota's Brainerd International Raceway and Iowa. • Is one of three drivers entered with wins at Iowa previously, having claimed the overall win in 2013, and has four top fives in six career starts at the track. • Ranks fourth in the West standings with five top fives and six top 10s in eight races this year. • Posted a career best finish of second in the most recent race at California's Sonoma Raceway, where he also won his first career pole. • Finished 24th overall last season in his only career start at Iowa. • The 2017 season is the 31st for the NASCAR K&N Pro Series East and the 64th for the K&N Pro Series West. • The 2017 East schedule features 14 races at 13 different tracks across the United States, while the West has 14 races at 12 different tracks. • Ronnie Bassett Jr. earned his first career East win in the season opener at New Smyrna. • Point leader Harrison Burton earned his first career win at Bristol and became the series first four-time winner this season with a victory at Thompson. • Todd Gilliland has won two of the last three East races. • Chase Purdy has won four straight East poles heading to Iowa. • Gilliland, who won the first five West poles of the season, swept the Twin 100s at Irwindale in March as part of a stretch of four straight wins. • Chris Eggleston won the West season opener at Tucson and the two straight events at Orange Show and Colorado National. SACRAMENTO, CALIFORNIA (July 26, 2017) - The tight battle at the top of the 2017 Pacific Challenge Series presented by PenneyLawyers.com continues with a trip to the series' tightest facility, as the Super Late Model drivers take to the quarter-mile Ukiah Speedway this Saturday. 2015 PCS champion John Moore leads 2014 PCS champion Mike Beeler and 2015 Rookie of the Year Cole Moore into Saturday's main event. PCS racing in 2017 has been wide-open with no repeat race winners through the first five races. Four of the five winners - Carlos Vieira, Derek Copeland, Jeff Bischofberger, and Cole Moore - were first-time PCS winners before John Moore grabbed the Ron Strmiska Memorial on July 1st at Stockton. The elder Moore ran all three Ukiah events in 2015 and ran fifth, third, and fourth. His son Cole has only one top-five in three starts but it was a strong second place finish in October 2015. The Moores have battled extensively on track this year including down to the wire in the Stockton race four weeks ago. John Moore's fifth place finish in the May race at Stockton is his low point of a near perfect season while Cole Moore has finished in the top-two in three consecutive races. Mike Beeler has finished in the top-two of the points for three consecutive seasons and is on-track for his fourth consecutive top-two from the second spot currently. Beeler has been a model of consistency with three fourth place finishes and a second place finish so far. His Ukiah resume includes a win last year and six top-fives in his eight starts. Jason Romero's championship contending season has slipped slightly to the fourth position in the standings but still well within striking range. The four-time All American Speedway PCS winner in 2016 has not reached victory lane yet in 2017 but ran second to start the year at Madera and third at the May Stockton race. The 2009 All American Speedway track champion has never run a PCS race at Ukiah. Rounding out the top-five is 2016 Rookie of the Year Matt Wendt of Galt, who has finished sixth three times this year along with a seventh place effort in the Strmiska Memorial. Wendt will pilot a JD Motorsports entry campaigned by Jeremy and Mike Doss. Jeremy Doss, the 2012 & 2016 series champion, won the PCS season finale at Ukiah last year. Jack Wood leads the rookie standings out of the sixth position in the points and will try to better his career-best sixth place effort from the Strmiska Memorial. He leads his cousin Travis Milburn of Eagle, ID by ten points with Valley Springs' Tracy Bolin in eighth. Elk Grove's Mike Hite is the other competitor who has appeared at all five races, but a slew of mechanical problems has relegated him to tenth in the points although he is tied with ninth place Doss in the standings. 1th place in the standings is Chris Scribner of Loomis who has run in the top-three on three occasions at Ukiah including a victory in May of 2014. Other series regulars such as JR Courage and Danny Malfatti have also recorded their series-best performances at the quarter-mile with Courage running second last July after leading the first 48 laps while Malfatti ran fourth last October. Several regional drivers are expected to compete along with the return of Austin Gant to series competition after taking 2016 off. A strong field will treat the fans to a great night of action that also includes the fast-growing Limited Modifieds, Bombers, Pro 4 Modifieds, and Drifting. Activities get underway on Friday with practice. Pit gates open at 10 a.m. on Saturday with practices to follow and qualifying at 5 p.m.
Grandstand tickets are $12 for Adults 16+, while Kids 6-11 and first responders are $6. Seniors and Students are $9. Kids 5 and under are free. A family pack for 2 Adults and Kids is $30. The Pacific Challenge Series is presented by: Penney Racing Supply, Penney & Associates, American Racer Tires, Law Talk, Compact-It, Northwest Compactors, Naake Suspension, Sunoco Fuels, Five Star Bodies, BrakeOMeter, Lefthander Chassis, ARP Bodies, Joes Racing Products, Bassett Wheels, Frank's Radio, WrapStar Pro, and Blakesley Sports Media. All PCS Super Late Models race ABC Bodies or Muscle Car bodies on American Racer Tires with Sunoco Racing Fuel. DAYTONA BEACH, Fla. — Once again, the NASCAR K&N Pro Series divisions converge on Iowa Speedway in Newton, Iowa, for the Casey’s General Store 150 presented by Vatterott College on Friday, July 28. The annual combination event for both the K&N Pro Series East and West features teams from each series going head to head on the .875-mile D-shaped oval, and since its inception, the race has been a proving ground for future NASCAR success. The West has been on a roll over the last few years in the event. While East drivers won each of the first seven combination races at Iowa dating back to the inaugural event in 2007, West teams have now accounted for three straight victories and four of the last seven overall. Reigning West champion Todd Gilliland enters the weekend as an early favorite, leading the K&N Pro Series West standings in defense of his 2016 title — which included a win in this event — and heading into the weekend having won the most recent East race at New Hampshire Motor Speedway. Gilliland, of Sherrills Ford, North Carolina, has an 11-point lead atop the West standings and is second in the East, just 14 points shy of leader Harrison Burton. EVENT SCHEDULE: Friday, July 28 — Garage opens: 10 a.m.; Practice: 2-3 p.m.; Final practice: 3:15-3:55 p.m.; Driver autograph session: 4:10 p.m.; Group qualifying: 5 p.m.; Casey’s General Store 150: 7:30 p.m.
NASCAR IMC CONTACT: Brooke Franceschini, (386) 631-6142, bfranceschini@nascar.com. The Race: The Casey’s General Store 150 will be the 10th of 14 races on the 2017 NASCAR K&N Pro Series East schedule, and it is the ninth of 14 races on the 2017 NASCAR K&N Pro Series West schedule. The Procedure: The starting field is 36 cars, including provisionals. The first 28 cars will qualify through the group qualifying process while the remaining eight spots will be awarded through the provisional process. The race will be 150 laps, spanning 131.25 miles, and there will be a five-minute break at or near the conclusion of Lap 75. The Track: This is the 15th combination race for the K&N Pro Series at the .875-mile D-shaped oval dating back to May 2007. There has been at least one race held at the track in each season since. Designed by former Monster Energy NASCAR Cup Series champion Rusty Wallace, it plays host to NASCAR XFINITY Series and NASCAR Camping World Truck Series races annually. Race Winners: There have been 13 different winners in the 14 combination races held at Iowa, with Brandon McReynolds being the only multi-time winner at the track after sweeping the two races there in 2015. Monster Energy NASCAR Cup Series champion Kyle Busch won the K&N race there in 2009, while 2015 Daytona 500 winner Joey Logano won the inaugural event in 2007, beating runner-up Kevin Harvick. Track records: The one-lap series qualifying record at Iowa was established by Kyle Busch on May 17, 2009 at 135.484 mph (23.250 seconds). The 150-lap race record was set by Todd Gilliland last season at 98.505 mph (1 hour, 20 minutes, 7 seconds). New Points System: The K&N Pro Series annual combination event will feature a new rule package this year. For the first time drivers will be awarded overall points based on where they finish rather than in their respective series. This will allow drivers and teams to compete for championship points in both the K&N Pro Series East and West; drivers must designate which series they will receive points (East, West or both) prior to the event and hold the appropriate NASCAR license. Career Building: Of the 14 previous winners at Iowa Speedway, five went on to Monster Energy NASCAR Cup Series careers with several others moving into other NASCAR national series. Current Cup Series driver and 2015 Daytona 500 winner Joey Logano won the inaugural event in 2007, while 2015 Cup Series champion Kyle Busch won at Iowa two years later. Brett Moffitt, Corey LaJoie and Chase Elliott all have Iowa wins in the K&N Pro Series on their resumes. In 2012, Elliott held off fellow future Cup driver Ryan Blaney for the victory. Brian Ickler, Cole Custer, Ben Rhodes and Brandon Jones also won races at Iowa before moving up the NASCAR ladder to the XFINITY Series or Camping World Truck Series. One Debut, Two Return: Two-time K&N Pro Series East race winner Ben Kennedy returns to the series this weekend at Iowa, driving the Kevin Manion-owned No. 1 Menards Toyota. The former Monster Energy NASCAR Cup Series crew chief enters the K&N Pro Series for the first time after several years of fielding NASCAR Whelen Modified Tour cars on a part-time basis. Kennedy, who competed full-time in the Camping World Truck Series from 2014 to 2016, has run part-time in the NASCAR XFINITY Series this season with a best finish of sixth at Loudon in nine starts. Kennedy isn’t the only driver making a return to his roots this weekend. Jeff Green, the 2000 XFINITY Series champion and longtime competitor in both that series and the Cup Series, will make his first career K&N Pro Series start for owner Eric McClure. Michael Self, who has won twice at Iowa in 2012 and 2013, continues his return campaign in the K&N Pro Series West with Sunrise Ford Racing. Hot Streaks: K&N Pro Series East point leader Harrison Burton, son of longtime Cup Series driver Jeff Burton, has been the hottest driver in the series this season. Burton has won four of the nine races this season and has finished outside the top five only once — at Berlin earlier this month, when he finished sixth — to lead the point standings by 14 over Todd Gilliland. In the West, former champion Chris Eggleston of Erie, Colorado, has been strong in the middle stages of the season. He won back-to-back races at California’s Orange Show Speedway and his home track of Colorado National Speedway, to move within just 11 points of West leader Gilliland with three wins this season. Like Burton, Eggleston has finished outside the top five only once all season, when he was 10th in the most recent event at California’s Sonoma Raceway. International Flavor: The K&N Pro Series ranks, whose NASCAR Drive For Diversity program produced Kyle Larson — who is second in the Monster Energy NASCAR Cup Series standings — Daniel Suarez and Darrell Wallace Jr., among others, continues to feature a diverse lineup. Mexican driver Ruben Garcia Jr. will join Takuma Koga of Japan in Friday’s field. Rev Racing teammates (and brothers) Collin Cabre and Chase Cabre will also compete in the Casey’s General Store 150. African-Americans Jesse Iwuji and Jay Beasley will be in the race, too, as will two women in Nicole Behar and Julia Landauer. In total, one-quarter of the drivers on the early entry list for the Casey’s General Store 150 are either minority or female drivers. NASCAR Next: The field for this weekend is packed with NASCAR Next talent. In addition to current members - Harrison Burton, Chase Cabre, Todd Gilliland and Chase Purdy - alumni Nicole Behar, Collin Cabre, Tyler Dippel, Ben Kennedy, Julia Landauer, Jesse Little and Michael Self are all slated to compete in the Casey's General Store 150 presented by Vatterott College. Since the program's inception in 2011, NASCAR Next drivers or alumni have taken all but one of the overall wins at Iowa Speedway. MADERA, CALIFORNIA (July 25, 2017) – $5,000 to win RPM Mortgage Pro Late Models and 75 laps of 51FIFTY Energy Drink Jr. Late Model racing makes up Saturday's inaugural Summer Speedfest at Madera Speedway. The action will be part of the fifth night of MAVTV-televised Late Model racing for the 2017 season. 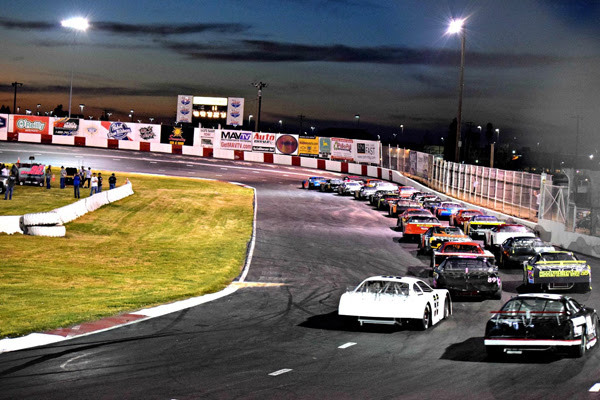 The once per month twin bill of Late Model competition has rewarded fans at the one-third mile oval with some of the best racing in the country. 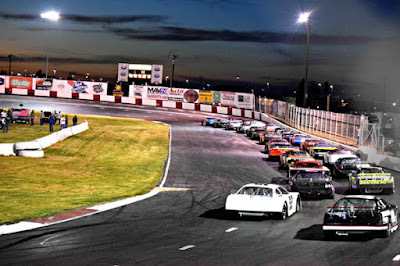 With $5,000 on the line for Pro Late Model competitors, the competition level in the 125 lapper is expected to be at its peak so far this year. 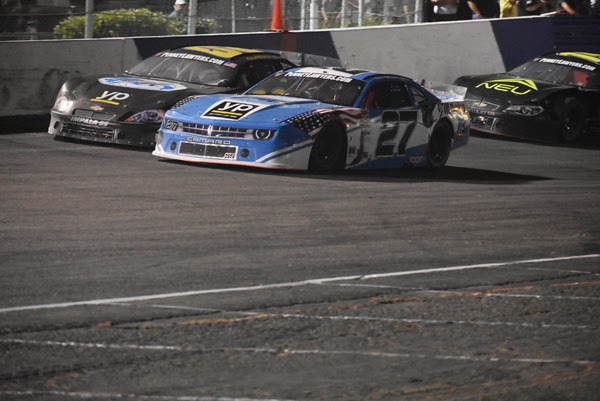 The Pro Late Model drivers have remained busy, taking in a pair of July races in the separate Madera Late Models division for non-televised events. 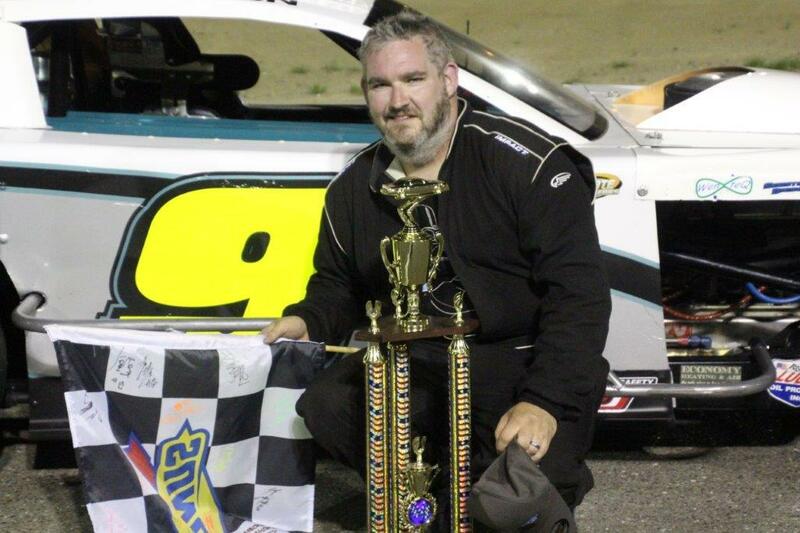 2016 Pro Late Model champion Matt Erickson scored the July 1st victory in front of a packed house on Fireworks night, while Jr. Late Model regular Eric Nascimento, Jr. won on July 15th in his inaugural Madera Late Model start. But it is 2015 Pro Late Model champion Buddy Shepherd of Bakersfield with the biggest head of steam. Between wins in both the April and May 100 lap races, along with coming within 500 feet of victory in June and winning the SRL Southwest Tour race at Madera on July 15th, Shepherd has emerged as the strongest Late Model competitor in the Central Valley. The driver who has kept Shepherd honest has arguably been Napa teenager Logan Zampa with a pair of runner-up finishes and winning the most recent event in June for three top-twos in four starts. Those performances have lifted Zampa to second in the points behind Shepherd, with Modesto's Garland Tyler rounding out the top-three. Tyler has a pair of third place finishes boosting his campaign. Dillon Tucker and Ryan Hart make up the rest of the top-five in the order, with Erickson relegated to sixth so far at the halfway point of the season with four races down and four to go. Five-time 51FIFTY Jr. Late Model winner Austin Herzog is seventh as the leading rookie driver after nearly collecting victory in June before tangling with Shepherd in the final corners. Rick Thompson, Glen Cook, and Howard Holden represent the rest of the top-ten. Jesse Love IV, age 12 of Menlo Park, had put his stamp on the 51FIFTY Jr. Late Model competition all season by winning the first three races of the year before Austin Herzog took the win on June 17th. Love's teammate Hailie Deegan is in the second position in the points but has a substantial 47 point deficit. The points standings are very close behind Deegan, with Redwood Valley's Kolby Berry in third. Berry has been the fast-time qualifier in all four events and has a second place finish in the season opener on his resume. 12 year-old Austin Edwards has been bolstered by a runner-up effort in the April race to rank fourth while five-time series winner Austin Herzog is fifth. Las Vegas' Kyle Keller, Nascimento, Jr., Jesse Burks, Jarrett Gilmer, and Las Vegas' Tanner Reif make up the rest of a very close top-ten. Reif's younger brother Tyler leads the Mini Cups into action after several dominating wins with Stockton's Joey Stearns finishing second in both races this year. Joseph Holiday has qualified third in both races and has finishes of third and fourth. The youngest drivers at Madera will run a 20 lap feature. Rounding out the program will be the Toyota Sedans with a 25 lap main event scheduled. Back-to-back third place finishes has Mike Marley leading Thomas Magray by 55 points in the championship. An open practice kicks off the weekend on Friday before a full day of action on Saturday. Friday practice runs from 5 p.m. - 8 p.m. On Saturday, pit gates open at 1 p.m. with practice from 3 p.m. - 4:30 p.m. Qualifying will follow with B Mains and Heat Races beginning at 6 p.m. Opening ceremonies and main events will follow at approx. 7 p.m.
Tickets for this great night of racing are $15 for adults, $13 for seniors and military, $7 for youth ages 6-12, and kids five and under are free! July 22, 2017 Eureka, CA...... On his first outing this season, Randy Houston of Medford, Oregon, led all but one round of the 60 lap feature, and held off the challenges of points leader Darrin Knight of Kelseyville to capture Race #7 of the North State Modified Series, presented by Protect the Harvest, at Eureka's Redwood Acres Raceway Saturday night. Collins drew the number 4 for the invert putting Houston and Knight in the front row. Knight powered to the lead at the start and held that position for a lap and a half, but Houston stayed right by his side and finally pulled ahead and into the lead. Knight dropped back in line followed by Collins, Kris Price, Darrin Sullivan, Eric Price and Dustin DeRosier. The pack ran nose-to-tail the first 10 rounds, and on lap 11 Houston ran high and Knight poked his nose in the hold. Houston shut the door to maintain his lead. At the same time Sal Lopez retired his car to the pits. Houston's car got loose on lap 14, giving Knight another opportunity, but Houston regrouped and stayed out front. Lap 18 saw Darrin Sullivan steal fourth away from Kris Price. The lapping process began on lap 20 with Orion Mosher going down a lap, and the leaders caught and passed Adrianna Strugnell on 22. Dave Campbell drove to the pits with a flat tire on 29, missing five laps before returning to action. At the Buckhorn Bar & Grill half-way point the running order was Houston, Knight, Collins, Sullivan, Kris Price, Eric Price, DeRosier, Eric Johnson, Richie Potts, Sierra Furia, Keith Bloom Jr., Cody Braund, Andy Vanderveer, Tom Ford, Simi Tour, Strugnell and Mosher. The only yellow flag in the 60 lapper was on the 47th circuit when Mosher spun on the back stretch. Houston powered ahead again on the restart and drove the distance for the $1350 victory. Knight finished a strong second, inches ahead of Collins. Kris Price passed Sullivan in the final laps to finish fourth and Sullivan was fifth. Rounding out the top 10 were Eric Price, Eric Johnson, DeRosier, Furia and Potts. Potts collected $100 for his win in the Lucas Oil Dash for Cash with Kris Price getting $50 for second. Andy Vanderveer passed the most car for the Keyser Hard Charger Award, Cody Braund received the Naake Suspension Award, the DJ Safety Certificate went to Sullivan, and Simi Tour got the Racer Bling Award. Scribner Plastic jugs went to Potts and K Price. The next race for the North State Modified Series will be at Ukiah Speedway on August 19. The North State Modified Series is presented by: Protect the Harvest, Lucas Oil, Sinister Diesel, Ward Ranches, Penney Racing Supply, American Racer Tires, Naake Suspension, Sunoco Race Fuels, Five Star Bodies, Racer Bling, Keyser Racing Products, Scribner Plastics, DJ Safety, and the Buckhorn Bar & Grill. NSMS modified rules, procedures, and schedules are available at www.northstatemodifieds.com. SUNOCO/PENNEY RACING SUPPLY TIME TRIALS: Charlie Collins (16.267), Kris Price (16.344) Darrin Knight (16.393), Randy Houston (16.411), Darrin Sullivan (16.488), Richie Potts (16.510), Eric Price Jr. (16.515), Eric Johnson (16.539), Dustin DeRosier (16.570), Cody Braund (16.573), Sierra Furia (16.659), Dave Campbell (16.684), Tom Ford (16.699), Keith Bloom Jr. (16.715), Simi Tour (16.730), Andy Vanderveer (16.822), Adrianna Strugnell (16.828), Orion Mosher (17.236), Sal Lopez (17.619).